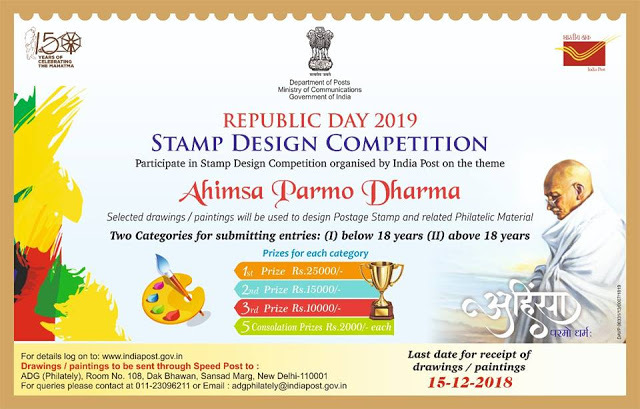 Department of Posts is conducting a Stamp Design Competition for the Republic Day, 2019. The Competition is open to all. First prize Rs. 25,000/-. Please log on to www.indiapost.gov.in andwww.postagestamps.gov.in for more details. Participate and win exciting prizes...! The senior citizen savings scheme offers an interest rate of 8.7 per cent per annum. India Post offers a number of saving schemes ranging from Senior Citizen Savings Scheme (SCSS) to Post Office Recurring Deposit (RD) Account, as mentioned on its official website- indiapost.gov.in. 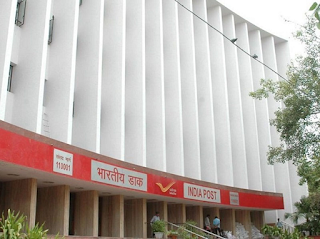 India Post has a network of more than 1.55 lakh post offices across the country and offers a variety of banking and remittance services, other than mailing services. Interest rates on post office saving schemes move in line with the government's interest rates on small savings schemes, which are revised on a quarterly basis. Recently, the government revised interest rates on small saving schemes for the quarter between October 1, 2018 and December 31, 2018. Post office Recurring Deposit (RD) account offers an interest rate of 7.3 per cent per annum, which is compounded quarterly. On maturity, a recurring deposit of Rs. 10 per month fetches a return of Rs. 725.05 on maturity and can be continued for another five years on a year-to-year basis. Post Office RD account can be opened by cash as well as cheque. Minimum amount for opening of post office recurring deposit account (RD) is Rs. 10 per month or any amount in multiples of Rs. 5. Post office time deposit (TD) or Fixed Deposit (FD) account offers interest rates across four maturities: one, two, three and five years. Post office fixed deposit for one year, two years, three years, and five years offer 6.9 per cent, 7 per cent, 7.2 per cent, and 7.8 per cent respectively. Interest is payable annually but is calculated quarterly. The minimum amount that one requires to open a fixed deposit with the post office is Rs. 200 can be opened by cash or cheque. However, there is no maximum limit. The senior citizen savings scheme offers an interest rate of 8.7 per cent per annum, which is payable from the date of deposit on March 31/ September 30/December 31 in the first instance and thereafter, interest shall be payable on March 31, June 30, September 30 and December 31. However, customer can make only one deposit in the account in multiple of Rs.1,000 which should not exceed Rs. 15 lakh. PPF accounts, which are also offered by banks, offer an interest rate of 8 per cent per annum, which is compounded annually. A minimum of Rs. 500 and a maximum of Rs. 1,50,000 can be deposited in a financial year in a PPF account. One can make deposits in lump-sum or in 12 installments.